The picture above is Randy, Josh, Tonya, John, Mary and a brand new Trek Soho S Single/Fixed gear bike at the Trek Store in Eastside. After delivering some coffee today I stopped by the Trek Store because the baristas at Tazza D’Oro said Josh had left a few messages for me. I thought he was calling to ask “where the heck is our coffee”. 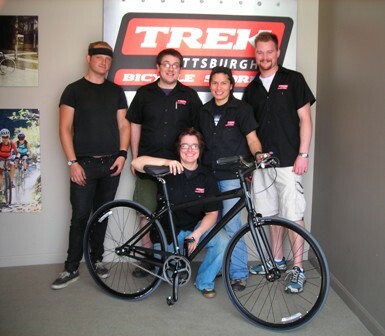 But instead, the staff at Trek had a present for me – yep, the bike in the picture. YEA!!! Still can’t believe it. Over the past year, Trek and Tazza D’Oro have worked in partnership bringing bikes, coffee and community together. I always felt really lucky to be hooked up with these guys. They totally get the local community thing and they are passionate about getting people on bikes and enhancing our quality of life thru bikes. They work really hard at making bike shopping and repair totally accessible to all. Plus they would let me go on and on about coffee while they were working on one of my bikes. Josh said they wanted to let me know how much they appreciate our partnership. And for me, I have felt really lucky to have such awesome friends in my life and a totally stand-up business involved with my business. Guys, you know how much I loved this bike since the first time I saw it, but the gift of your gesture has left me speechless. Thanks also to Don, the owner and Ted (not pictured cause he was waiting on a customer).